Earlier this week, OS X 10.10.3 was released, which includes the much-anticipated new Photos app — Apple’s full replacement for both iPhoto and Aperture. I’ve been using Photos App for several months now (since the first beta was made available). It’s now a major part of my photography workflow, and, therefore, my life. So, here’s a basic outline of my workflow. Have a camera. Take photos. Import photos into Lightroom. I do this once or twice a day. Scroll through photos, flag all potential keeper photos. Enable “Flagged” filter in Develop mode. Unflag any repetitive or meh photos I’m not feeling at the moment. Go through photos, one at a time, and apply selective edits to enhance the presentation of photos. Thanks to my beloved Fujifilm x100t’s Classic Chrome mode, it’s quite rare that I want to do much more than simple hilights and shadows adjustments. Final set of photos: export to disk as full-resolution high-quality JPEGs. Once the fully rendered JPEGs are available, I import these files into Photos App, where each Album has a nice home based on the type of photos it contains. 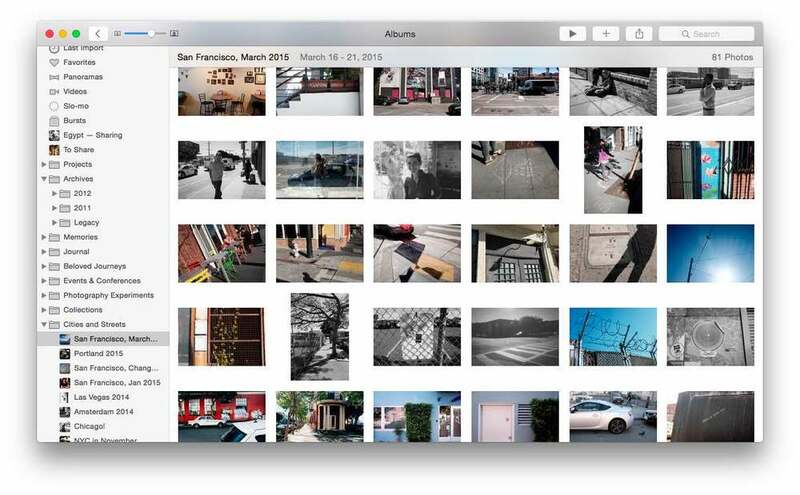 Right from Photos app, publish your beautiful photographic moments to Facebook, Flickr, etc. Photos App is a very capable photo editor as well as a catolouge. However, the nature of this non-destructive editing (much like Lightroom) gives me an odd feeling of ephemerality in my conanical photo acrive, which is unideal. I personally prefer to use Photos App as a “photo album” with completely rendered finalized JPEGs. However, if you find that the built-in editing capabilities fit well into your workflow, I highly recommend doing so! The color conversions and tools made available are first-class, especially for a consumer app. Simplicity is key to all workflows.